The price of capacity can vary widely by route. Levels of competition, degrees of market saturation, regulatory hurdles and deployment costs can all lead to drastically different pricing for the same capacity on different routes. 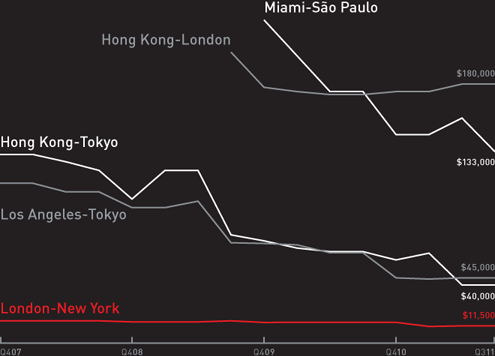 The median monthly lease price of 10 Gbps wavelengths between Hong Kong and London, for example, is more than 15 times greater than comparable capacity between London and New York. 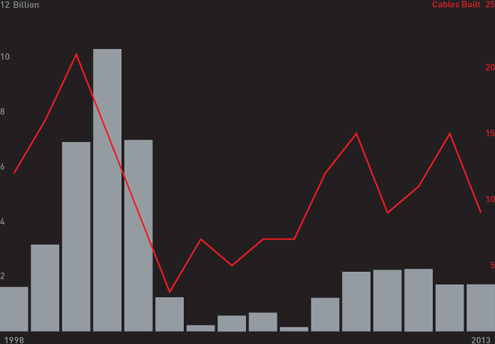 The rate of price decline for capacity can also vary from one route to the next. Upgrades and new cable construction have accelerated the rate of price decline on some routes, including intra-Asia and trans-Pacific, while other routes have seen relative price stability. The median price charged for 10 Gbps wavelengths on the Hong Kong-Tokyo route decreased over 50 percent between Q4 2007 and Q3 2011. In contrast, prices for 10 Gbps wavelengths between London and New York shifted only slightly during the same time span. NOTES Prices represent median monthly lease prices excluding local access and installation fees. All prices are in U.S. dollars. In 2000 and 2001 alone, 36 new submarine cable systems worth more than $17 billion entered service. In contrast, developers spent $10 billion on all cables entering service from 2002 through 2007, as both the number and cost of new systems in deployment dropped precipitously. In 2008, a small construction boom commenced. 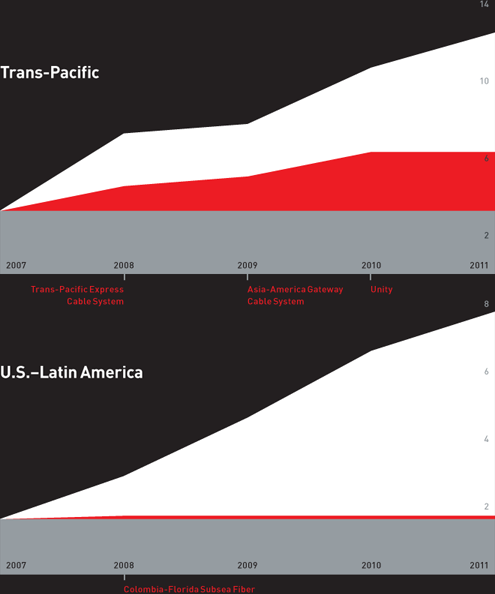 Between 2008 and 2011, 47 new systems worth $7.9 billion were launched. 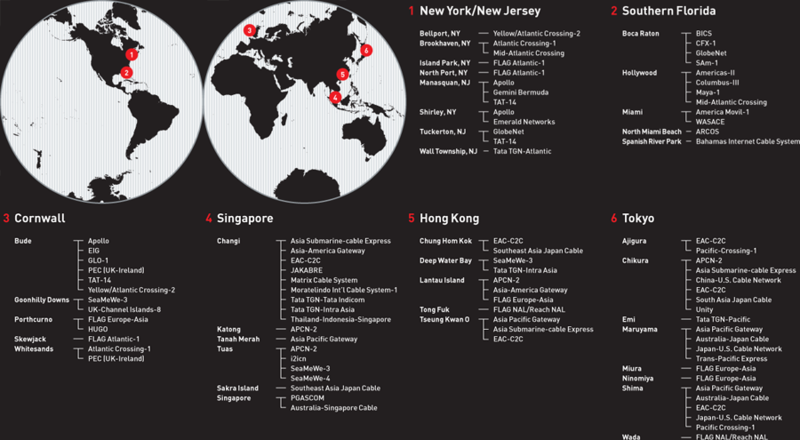 Another fifteen cables are tentatively slated to launch in 2012, followed by nine more in 2013. Estimates for total submarine cable construction costs in the next two years reach $3.4 billion. NOTES Construction costs based on the year that the cable entered service. Construction costs exclude the cost of subsequent capacity upgrades and annual O&M. 2012-2013 construction costs based on announced contract values and TeleGeography estimates. Domestic cables are excluded. 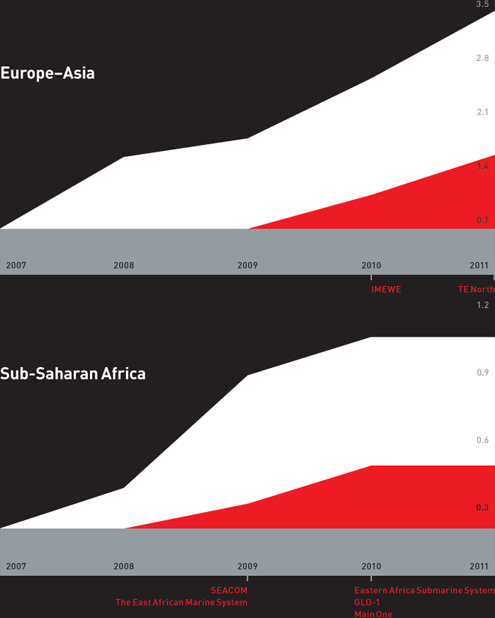 Since 2002, used international bandwidth capacity has increased more than 49-fold. Growth has been strongest on links to African, Latin American, and Middle Eastern countries, which experienced compound annual growth rates in excess of 70 percent between 2002 and 2011. However, only a handful of countries—the United States, Germany, United Kingdom, France and the Netherlands—have used international bandwidth greater than 10 Tbps. Submarine cable operators light capacity on their systems to use themselves or to sell to other carriers. The gap between lit and used capacity is striking. For example, less than half of lit trans-Atlantic capacity is used. Several factors account for this gap. Operators must keep up with demand by availing the market of more lit capacity than is required for purchase. Unused capacity can be held in reserve for restoration and redundancy. Some unused capacity is accounted for by other factors including contract structures [such as discounts on large purchases of bandwidth], upgrade lead times, and market inefficiencies. Lit capacity is used for circuits carrying one of three possible types of traffic: Internet, private network, and switched voice. Internet traffic accounts for most of lit capacity. Across the Atlantic more than 75 percent of used capacity is used to carry Internet traffic. Private network traffic comprises most of the remaining used capacity with switched voice accounting for just 0.2 percent of traffic. The introduction of new cables and capacity upgrades on existing systems both contribute to increased lit capacity. Across the Atlantic, the surge in lit capacity from 7.5 Tbps in 2007 to 16 Tbps in 2011 is solely attributable to upgrades on existing systems. In contrast, 33% of newly lit capacity across the trans-Pacific comes from new cable construction. NOTES Capacity figures denote lit capacity at the end of the respective year. For systems configured as self-healing or collapsed rings, lit capacity is based on the sum of both halves of the ring. Intra-Asia capacity includes cables with landings in both Hong Kong and Japan. 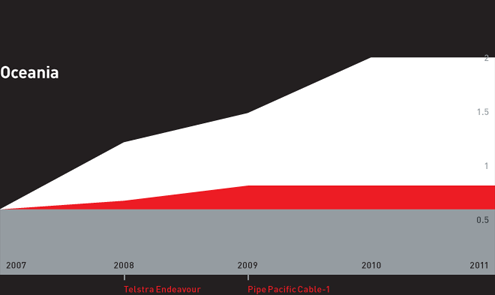 Trans-Pacific capacity excludes Southern Cross and Telstra Endeavour. Trans-Atlantic capacity excludes Atlantis-2. Europe-Asia capacity reflects available capacity between Europe and Egypt and excludes Europe-Asia capacity routed via Russia or the U.S. The reduction of long-haul transmission latency has become a key concern for content providers, financial institutions, and online video providers. For financial institutions, even a few milliseconds of reduced delay can improve the profitability of trading operations. Latency comes from a variety of sources, including network congestion, over-utilized routers, and firewalls. One important cause of latency in long-haul networks is "propagation delay." This refers to the time it takes for a signal to traverse fiber and is a function of geographic distance. The most commonly-used metric to express latency is the round trip delay, which is the time required for a signal to travel in both directions over a link. 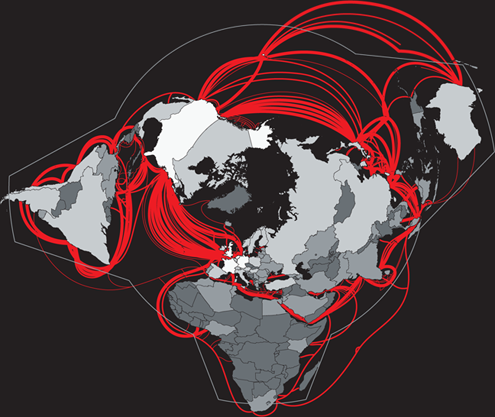 The figure to the right depicts the latencies of cables on the trans-Atlantic route. The statistics do not factor in the terrestrial backhaul required to link cable stations to major cities. So while one operator may provide superior subsea latency, advantage could go to another cable that has the lowest combined latency of the subsea span plus backhaul. The lowest trans-Atlantic latency is presently found on the Atlantic Crossing-1 South cable. NOTES Latency is expressed in milliseconds of round trip delay (RTD). Latency data were provided to TeleGeography by cable operators and have not been independently verified. Latency data presented do not supersede latency guarantees specified in customers’ service level agreements.